Allium fistulosum is a non-bulbing, leaf onion that produces clumps of tube-like hollow leaves with large creamy white globe shaped flowers in early summer of the second season. It is a very popular cultivated vegetable and an important ingredient in Asian cuisine. In Japan it is used in miso soup and in the takoyaki dumpling dish, among others. It is a versatile plant, the seeds can be used as sprouts, the leaves snipped for use in salads or the whole plant pulled up. It is often grown in a bunch as an ornamental plant. The Red Welsh is an old form of the perennial bunching onion with very decorative red stalks and a slightly stronger flavoured than the white variety. It is also slightly hardier. It is distinguished from the bulb onion by its round hollow leaves and only slight bulb formation. They are an interesting addition to a vegetable plot or herb garden that, once established, tend to look after themselves. The flowers are attractive to bees, while the whole plant is an effective insect repellent. It is very easy to grow from seed, extremely hardy and pest resistant. It will grow from cold regions right through to hot, tropical areas. "Welsh" is a corruption of the German "Walsch" meaning "foreign" and has no reference to Wales. The onion originated in Siberia, and is very popular in the East where it is known as Japanese leek, Japanese bunching onion or nebuka. The Welsh onion is also known as spring onion, ciboule (French), zwiebel (German), negi, chibol, sybie, sybow, and stone leek. While fistulosum means "hollow"
Choose an open, sunny site with good drainage which has preferably been dug and manured in the previous autumn. Do not plant or sow on freshly manured bed. Lime if the soil is acid. Avoid planting in an area where the previous crop was of the onion family. Many exhibitors grow their show onions in a permanent bed in order to build up fertility, but in the kitchen plot it is a much better idea to change the site annually. Apply a general fertiliser if needed and rake the surface when the soil is reasonably dry. Tread over the area and then rake again to produce a fine, even tilth. Seeds can be sown direct in autumn to be harvested in 46 weeks to produce large bulbs (not advisable in very cold areas) Otherwise sow in February under cloches or direct March to April and harvest in 22 weeks. In cold areas and for exhibition bulbs sow under glass in January, harden off in March and transplant outdoors in April. Sow very thinly in 1.2cm (½in) deep drills, leaving about 25 to 30 cm (10 to 12in) between rows. Water very gently if the soil is dry, and cover with soil. Thin spring-sown seedlings first to 2.5cm (1in) then when the seedlings have straightened up to 5 to 10 cm (2 to 4in) apart. Thin autumn sown onion seedlings to about 2.5cm (1in) in the autumn. Further thin to about 5 to 10 cm (2 to 4in) between plants in the Spring. Seedlings raised under glass should be transplanted 4in (10cm) apart, leaving 9in (23cm) between the rows. The roots must fall vertically in the planting hole and the bulb base should be about ½ in (1cm) below the surface. Plant firmly. Hoe carefully or weed by hand – dense weed growth will seriously affect yield. Water if the weather is dry (not otherwise) and feed occasionally. Feed in March. Mulching is useful for cutting down the need for water and for suppressing weeds. Break off any flower stems which appear. Stop watering once the onions have swollen and pull back the covering earth or mulch to expose the bulb surface to the sun. The entire plant may be pulled and eaten like a green onion as early as when 8 to 10cm (3 to 4in) high, or leaf portions may be snipped off as needed for flavouring. If pulled as a green onion, 4 to 5 months are required from seeding to harvesting. Allium fistulosum, the Welsh onion or Japanese bunching onion is a perennial onion. 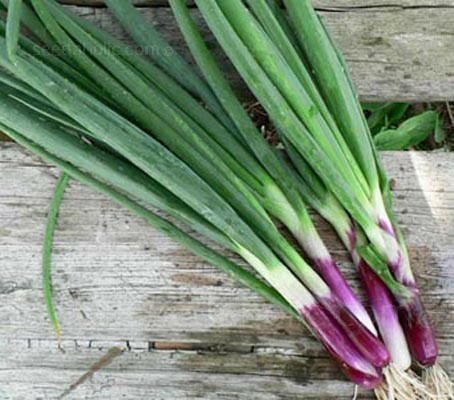 Other names that may be applied to this plant include green onion, spring onion, scallion, and salad onion. These names are ambiguous, as they may also be used to refer to any young green onion stalk, whether grown from Welsh onions, common bulb onions, or other similar members of the genus Allium. The species is very similar in taste and odour to the related bulb onion, Allium cepa, and hybrids between the two exist. The Welsh onion, however, does not develop bulbs, and possesses hollow leaves ("fistulosum" means "hollow") and scapes. Large varieties of the Welsh onion resemble the leek, such as the Japanese 'negi', whilst smaller varieties resemble chives. Many Welsh onions can multiply by forming perennial evergreen clumps.